Now, you can easily manage copying multiple files at once. He also showed how easy it is to move between the Windows 8 Explorer view back to the Start screen. Basically, it looks like you won’t miss the traditional Start button too much. Sinofsky said that Microsoft developed a new class driver for Windows 8, which allows all sorts of hardware to work seamlessly with the OS without needed a separate driver. He said that 80 to 90 percent of printers will work automatically. “It just works,” he said. 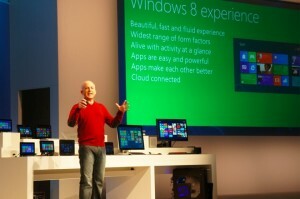 They proceeded to show off different types of Windows 8 hardware, including ultrabooks, more powerful laptops, and desktops. One ultra book sported a motorized mechanism to reveal full-sized ports, something that the MacBook Air and other ultra-portables give up on. Sinofsky said that Microsoft will follow its past release schedules with Windows 8: next up is the Release Candidate version, then the Release to Manufacturer (RTM) version. After that, Windows 8 will finally be available to the public. I install windows 8 consumer preview but the start menu apps doesn’t work why? could someone help me pzzzzzzzzzzz? I have installed window 8 consumer preview,in right setting>more pc setting is not displaying why? Arsalan i think you are the first user of windows 8 ,so you can search your more option with clicking in the place of old start menu option(windows7 start) and can use your more options…….